NAS vendors in the high-end enterprise space often reserve the more powerful CPU configurations for their rackmount models. A case in point is QNAP's Xeon based 200TB+ storage rack solution which we saw at CES. Thecus is one of the very few vendors (if not the only one) to adopt the full range of Intel CPUs in their tower form factor systems. Their previous generation enterprise tower models used Atom, Celeron and Core2-Duo CPUs. They topped out at 7-bays. Today, Thecus added some more members to update this lineup. The new members are the TopTower N6850, N8850 and N10850. They come with 6, 8 and 10 SATA bays respectively and run Thecus's custom NAS operating system. The table below compares the three models and the various features. All the three models have a HDMI output at the back along with a MIC input, Line In and Audio Out. There are two hot swappable system fans and a touch panel for basic operations on the system without a computer. We have 256-bit AES encryption support for the RAID volumes. There are iOS and Android apps available for monitoring and administration, uploading / downloading / streaming of multimedia files and file management. Supported cloud backup services include Dropbox, ElephantDrive, Amazon S3 (not at launch, but in a later firmware update) and Acronis. The firmware also ships with McAfee antivirus (compared to the open source ClamAV based solutions from other vendors). 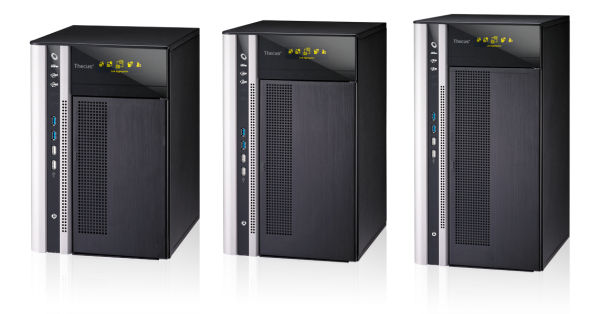 The TopTower N6850, N8850 and N10850 are all schduled to ship in May 2012 with MSRPs of $1700, $2145 and $2480 respectively. Independent companies also provide a battery replacement service, returning the original unit with new battery but original case. Alternatively it is possible for a technically competent user to buy and install a new battery, which may invalidate any remaining warranty on the iPad. The task does not require soldering, but is technically challenging. Thanks. The Nusselt analog has on occasion been used to actually measure form factors for complicated surfaces, by photographing them through a suitable fish-eye lens. But its main value now is essentially in building intuition. Thanks. In electronics, the form factor of an alternating current waveform is the ratio of the RMS value to the average value. It identifies the ratio of the direct current of equal power relative to the given alternating current. The former can also be defined as the direct current that will produce equivalent heat. Thanks. Retailers and distributors act as middle-men in getting goods produced by manufacturers to the intended consumer, generating a profit as a result of providing sales or distribution services. Most consumer-oriented stores and catalog companies are distributors. Thanks.